For an amazing workout, the 30% incline on the NordicTrack X20C Incline Trainer gets your cardio system pumping and effectively targets muscles in the trunk and lower body. It is also a powerful fat burning tool. The console on the NordicTrack X20C Incline Trainer has a full color 7" Touch Screen display with 1-touch programming for speed, incline, decline, programming and more. The 22 pre-programmed workouts focus on aerobic, weight loss, and performance goals. UPDATE: The X20C Incline Trainer is no longer being produced, replaced by a whole new lineup of incline trainers. Check out our expert's top Incline Trainer picks here. The NordicTrack X20C Incline treadmill addresses the problems with the X3 and X5i incline trainers, which suffered from a lack of power. The X20c offers much larger 3.5" precision-machined rollers to pull the belt, and a powerful 5.0 hp high torque AC speed control motor specifically designed for the X20. The unique motor system, located at the rear of the trainer rather than the front, provides 1500 lbs of lift force for better deck lift and stability. 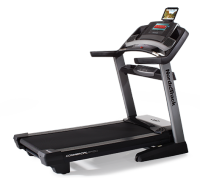 It also offers a cushioned 60" running area, as well as the leg-building 30% incline and -3% decline. The trainer is iFit® Live compatible (requires an in-home wireless network as well as the iFit Live module), which will allow you to expand workouts by downloading interactive training tools from the internet. It has an iPod® plug-in port, 3-speed workout fan, handlebar sensors for pulse rate monitoring, and an easy-to-use console. You won’t find many treadmill reviews on this new model. 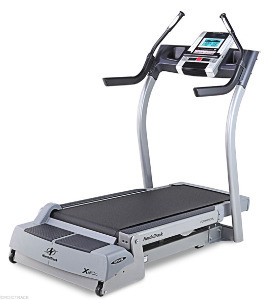 At $2999, the NordicTrack X20c incline treadmill is their most expensive incline trainer. Over the last couple of years, the Inclines have had repair issues with the X3 and X5 models, which cost half as much as the X20c. However, NordicTrack has installed a huge motor to overcome the burn out problems associated with this niche of machines. They are so confident that the trainer is sound that they back it with an astounding 5-year parts and labor warranty. If you are in the market for the next generation of treadmill/incline trainer, the NordicTrack X20C Incline Trainer is worth a look.